Home » Cryotherapy – The Miracle Solution for Sore Ski Legs? Cryotherapy – The Miracle Solution for Sore Ski Legs? There’s nothing worse than booking a ski holiday only to find that halfway through, your legs are screaming out for mercy at the end of each run. Whether this is due to a health issue or the fact you’ve been pushing yourself a bit further than normal, there’s no escaping the fact that it’s very, very annoying. No-one wants to have to cut their ski days short or even miss out on a precious day’s skiing because of sore legs. This is why osteopath of 20 years, Léo Meyer, has launched Go Cryo, the first cryotherapy centre in Serre Chevalier and Briançon. Cryotherapy involves immersing your body in temperatures between -80 and -100˚C for around 3 minutes. Its suggested benefits are vast, from sport/injury recovery and performance enhancement, to aiding skin problems, anxiety, sleep deficiencies and weight loss. Cryotherapy has been a popular therapy amongst elite athletes for years – Cristiano Ronaldo is a fan, and it’s rumoured that the therapy helped the Leicester team of 2016 to their unprecedented premier league win! So might cryotherapy be the new go-to therapy for skiers and snowboarders? 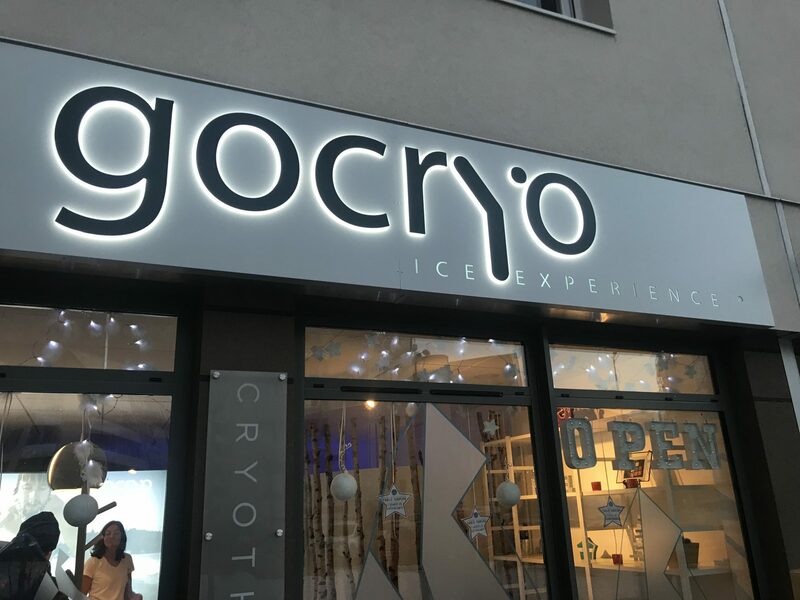 We visited Serre Chevalier this winter and had the opportunity to visit Go Cryo and see whether cryotherapy is in fact the ultimate solution to sore ski legs. Whole body cryotherapy is an extreme cold treatment that purports to aid injuries, enhance physical recovery and increase energy and mood. Using an electric cabin, your body is totally immersed in freezing cold temperatures as low as -100 degrees C. This cold is created without nitrogen, so it is extremely dry and offers no risk of burns. This dry and intense cold induces thermal shock in the body and it is this shock which brings the health benefits of cryotherapy. Thermal shock activates your endorphins, which act on chronic pain and reduce inflammation, whilst also creating an oxygenation and detox effect by slowing down nerve conduction and directing blood from superficial tissues to vital organs. The extreme cold allows your body’s natural reflexes to kill any pain in the body by stimulating the sympathetic nervous system, and also leads to enhanced circulation of white blood cells, activating your immune response. Upon leaving the booth, your blood gradually returns to your muscle and tissue, now rid of its toxins and full of oxygen and you will be full of endorphins. 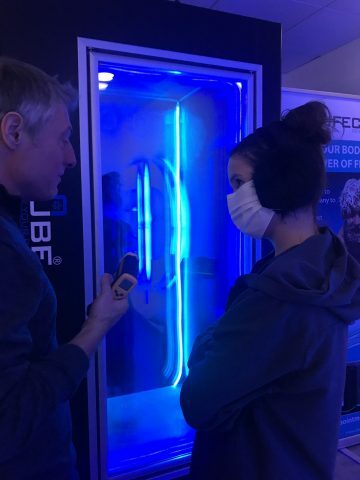 According to Go Cryo, cryotherapy can be beneficial for a huge number of sport, health and welfare issues, from post-event recovery, sports performance, multiple sclerosis jet lag, sleeping issues, anxiety and even cellulite! So, while cryotherapy is a popular treatment for sports men/women and people with medical issues, it can also very beneficial to the general public and recreational skiers. When you enter the centre, you are greeted by friendly faces, a tranquil atmosphere and a highly educated team, who can offer a wealth of information and knowledge on the process and its benefits. Once you are ready to go, you need to get changed. 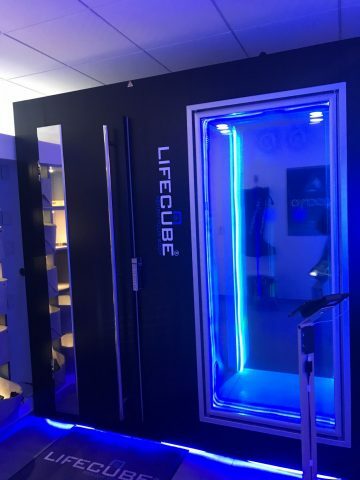 With cryotherapy you are supposed to really feel the cold (that’s kind of the point), so underwear or a swimsuit is preferable, though you can opt for a pair of shorts as well. You are given socks and sandals as the floor is very very cold, a face mask to protect your lungs and ensure your breathing isn’t affected, a pair of gloves and, my personal favourite, fluffy ear muffs to protect your extremities. You are also afforded a dressing gown to keep you warm until the last possible moment! You will feel rather odd, I mean this isn’t an outfit one would normally don whilst in a ski resort, but it’s all necessary! Your body temperature is measured just before you step in, (with the device Leo is holding above, which doesn’t even need to touch your skin) so that an accurate comparison can be given as you finish your session. Initially, you enter the left side of the cabin, which is kind of like a ‘staging’ area, easing you into the cold. You spend around 10 seconds in here before moving into the second, much colder booth. Once you have warmed back up after your session, you can either take a moment to sit with a drink in the relaxation room, simply get dressed and go, or try one of the other treatments available here. Go Cryo offer Normatec® treatments, where devices wrap around your arms or legs and provide a deep massage to increase blood circulation and allow drainage of excess fluids. Or, you can try Cryolipolysis, an innovative technology which claims to crystallise and kill fat cells, which will then leave your body naturally over the following weeks, aiding weight loss. I will happily admit that I was quite sceptical about the whole experience, as I believe many would be. The idea that standing in a box at -90 degrees for three minutes can be so beneficial to your health does beggar belief. However, in my opinion, it definitely worked. Immediately upon exiting the booth I felt a rush of endorphins. (Whether this was partly due to the relief of imminent warmth I cannot say, but it was a great feeling!) My whole body felt invigorated, fully refreshed and delightfully relaxed, which led to the best night’s sleep I have had in a long while. I was semi-hoping to feel like a completely new woman the next day, with my legs having turned back the clock a few years… I didn’t have this incredible transformation, but I definitely did feel different. My legs felt more energetic, responsive and much less stiff than they usually do after a couple of days’ hard skiing. I found that throughout the day my energy levels were more consistent and I was skiing much more confidently than previous days. Scientific studies of cryotherapy bring mixed results, some find that it does aid physical recovery, whilst others are not able to establish sufficient evidence to support these claims. However, it is undeniably a unique and interesting experience and if there’s the chance it can have these awesome effects on our health and wellbeing, it’s worth a try in our book. If you’re someone who hates to spend money on a ski holiday only to find your aching legs ruining your experience, a 3-minute cryotherapy session could be the most economical and convenient way to reboot your system. Forget lengthy physio appointments or massages, forget the effort of saunas, steam rooms and plunge pools (the latter of which quite frankly are not very enjoyable), five minutes at Go Cryo and you’ll be good as new! Don’t just take it from us though, this place is a very popular spot with the locals, even though it opened only weeks ago. The customer before me had been preparing for his pisteur examination later that night, so was using cryotherapy to ensure that his legs were in tip top condition for what was sure to be a gruelling night’s skiing. Then as we were leaving, the place began to fill up once more. A couple arrived who were regulars at Go Cryo, having purchased a number of sessions (multiple sessions are available for a discounted price). They told us that the cryotherapy had been hugely helping them with their health issues. The man in particular had been suffering with painful arthritis for years, but claimed that through repeated cryotherapy sessions, he was now at a point where he could finally ski again. So is it a miracle solution that we should all be doing on our ski holidays? If you’re someone that enjoys every moment of their ski holiday without an ache or pain in sight, then probably not – if it ain’t broke, why fix it eh? But if you are someone that struggles with aches, pains, anxiety or general low energy levels, this could be a really good way to get the most out of your ski holiday and truly enjoy your time away. At €45 per session (€60 for two people), the price is very decent and if you’re paying a lot of money for a ski trip, what’s a little bit extra to ensure you can fully enjoy it?